SEEDS OF CHANGE: NO NUKES! NO WARS! 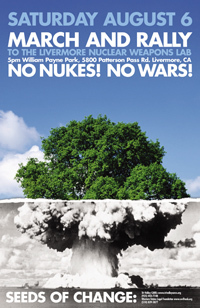 SATURDAY, AUGUST 6, “Seeds of Change: No Nukes! No Wars!�? SATURDAY AUGUST 6: SEEDS OF CHANGE: NO NUKES! NO WARS! 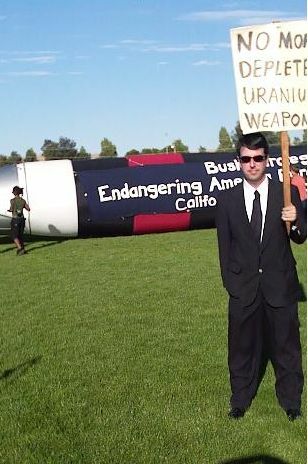 RALLY AND MARCH TO THE LIVERMORE NUCLEAR WEAPONS LAB. Livermore Lab is one of the world’s primary sites for the creation and development of nuclear weapons. To volunteer and for more info: (925) 443-7148 Tri-Valley CAREs www.trivalleycares.org ; (510) 839-5877 Western States Legal Foundation www.wslfweb.org ; and Livermore Conversion Project (510) 663-8065. The Bay Area’s Livermore Lab is one of the three national laboratories that serve as the brain of the U.S. nuclear weapons complex, which today is modernizing and developing nuclear weapons to support U.S. wars of empire. August 6 and 9, 2005 mark the 60th anniversaries of the atomic bombings of Hiroshima and Nagasaki by the United States. Join with thousands of people at four central US nuclear weapons sites to call for an end to the development and production of nuclear warheads. enough for 300 nuclear bombs! Plutonium was recently found on site to be absurdly stored in paint cans and food cans. occupation. A majority of people in this nation now oppose the war, but the White House and most members of Congress are resisting the only solution to the crisis: bring the troops home immediately. 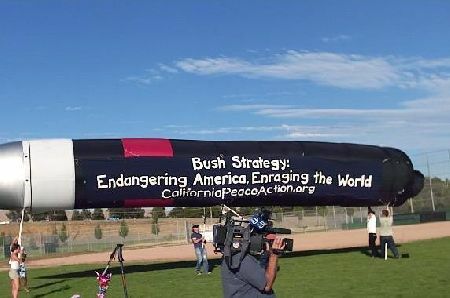 We will send our message loud and clear to decision-makers and the public at large: End the war in Iraq, End the threat of nuclear annihilation! The sunflower is the international symbol for the abolition of nuclear weapons. We invite you to create paper sunflowers to be planted at the gates of Livermore Lab. Sunflowers can be large or small, painted, be creative. Make sure to include your name and hometown on the sunflower. For full instructions and mailing directions: www.wagingpeace.org/sunflower . WATSONVILLE NATURE CENTER (see below for directions). The Watsonville Brown Berets will be hosting a sunflower making party as a pre-event to the Livermore Action August 6th. Tri-Valley Cares have asked participants to bring homemade sunflowers (the international symbol for nuclear abolition) to put on the Lawrence Livermore Lab gates. We will be making homemade sunflowers to bring with us on the 6th. You can also print sunflowers online if you can not make your own: For full instructions and mailing directions: www.wagingpeace.org/sunflower. Please bring any supplies you can that would be fun to use (cardboard, tissue paper, construction paper, scissors, glitter, paint, pencils, pens, stickers, pipe cleaners, wire, puff paint, etc). The more the merrier! I will provide some basic materials, but please bring some material/tool to share. Also bring a snack, dish, or drink to share and we can have a picnic lunch (or at least some munchies)! THIS IS A GREAT NETWORKING OPPORTUNITY FOR ALL THE CENTRAL COAST ANTI-WAR, COUNTER RECRUITMENT, AND PEACE GROUPS TO GET TOGETHER, EXCHANGE IDEAS, AND BUILD SOLIDARITY! Email katie davis at katie (at) lifelab.org or call 831-227-6909 for more info. March and Rally at core nuclear weapons sites across the United States. Join the global majority in saying “Hiroshima and Nagasaki, Never Again!!!�? Join us in Santa Cruz to commemorate the 60th anniversary of the United States’ use of atomic weapons against the people of Hiroshima and Nagasaki in 1945. TUESDAY, AUGUST 9, NAGASAKI NEVER AGAIN!!! Take I-580 exit Vasco Rd. go South. Take a right on Patterson Pass Rd. Music at the gates will be provided by Clan Dyken. NONVIOLENCE GUIDELINES: Nonviolence has always been a core value of the anti-nuclear movement. Details about the nonviolence guidelines and a complete list of sponsors and endorsers are available at: www.trivalleycares.org and www.wslfweb.org . Organize a candlelight vigil at your city hall on the 60^th anniversary of the bombing of Nagasaki. In addition, you can organize readings, lantern lighting ceremonies, the shadow projects and more. In support of the Mayors for Peace, we are calling on local groups to invite their Mayors to participate in the vigils and read out proclamations. capwiz.com/wagingpeace/mail/oneclick_compose/ Act now to stop a new generation of nuclear bombs. Ask Congress to cut $2 billion to restrain dangerous nuclear weapons programs. Donations should be made out and mailed to: Livermore Conversion Project, PO Box 31835, Oakland, CA 94604. Checks of more than $50 are tax-deductible if made out to Agape. Tri-Valley Communities Against a Radioactive Environment (CAREs), Veterans for Peace San Francisco Chapter 69, Wellstone Democratic Renewal Club , Western States Legal Foundation, Women’s International League for Peace and Freedom and Women for Peace. Participating Central Coast Organizations include: Watsonville Brown Berets, Resource Center for Nonviolence, UCSC Students Against War, Weapons Inspection Team, WILPF. Just wanted to remind peoples about our carpool to the Seeds of Change March and Rally at the Lawerence Livermore Nuclear Labs! Meet and Gather at 2pm. Leave 3pm sharp! Well, we ended live human disections by ending the war. We made sure Japan would never commit another Nanking or Bataan... and the list goes on. Would you have wanted to invade Japan in 1945? They would kill prisoners of war because it was not honorable to surrender, so it was tough on our soldiers. Did you mark the anniversary of Nanking, Bataan, Pearl Harbor............? WAS HIROSHIMA NECESSARY TO END THE WAR? There is a widespread belief among Americans, particularly soldiers who were serving in the Pacific Theatre in the summer of 1945, that an invasion of Japan would cost as many as a million American lives, and the use of the atomic bomb at Hiroshima and Nagasaki brought the war to an end, with enormous saving of lives, both Japanese and American. The reality is that in the months just prior to the August bombings, most of Japanese shipping, rail transport, and industrial production had been wiped out by an extraordinary series of air attacks. (More people died in one night in the fire bombing of Tokyo than died in the bombing of Hiroshima.) Millions were homeless. By July of 1945 both the Japanese and American military knew the war was lost. Yet the myth persists that the use of nuclear weapons was necessary-- Ted Koppel repeated it in a Nightline broadcast--that "What happened over Japan...was a human tragedy...But what was planned to take place in the war between Japan and the United States would almost certainly have been an even greater tragedy." The question of whether use of the bomb was necessary haunts us because if the bombs were not necessary they were war crimes, something painful for Americans to consider. It is true that by the end of World War II the lines between waging war and simply killing people in large numbers had been largely erased. The earlier strategy of air attacks had been to pinpoint strategic targets, but in Europe, by early 1945 the air attacks had assumed a different character--as if whatever sense of moral restraint had existed when the war began had vanished. The bombing of Dresden was not a military target. The fire bombing of that city created a fire storm resulting in a terrible loss of civilian life. Certainly prior to 31 December 1945, and in all probability prior to 1 November 1945, Japan would have surrendered even if the atomic bombs had not been dropped, even if Russia had not entered the war, and even if no invasion had been planned or contemplated. Not known to the general public until after the war, Japan had begun to put out feelers about surrender by May of 1945. On May 12, 1945, William Donovan, Director of the Office of Strategic Services (which later became the CIA) reported to President Truman that Shinichi Kase, Japan’s minister to Switzerland, wished "to help arrange for a cessation of hostilities." He believed one of the few provisions the Japanese would "insist upon would be the retention of the Emperor." A similar report reached Truman from Masutaro Inoue, a Japanese official in Portugal. In mid-June Admiral William D. Leahy concluded that "a surrender of Japan can be arranged with terms that can be accepted by Japan and that will make fully satisfactory provision for America’s defense against future trans-Pacific aggression." Meanwhile, the U.S. learned through intercepted diplomatic cables (the U.S. had broken Japanese codes early in the war) that the emperor of Japan wished to send Prince Konoye to Moscow as his personal representative to "ask the Soviet Government to take part in mediation to end the present war and to transmit the complete Japanese case in this respect." In President Truman’s handwritten journal, only released in 1979, he noted in July of 1945 that Stalin had reported "a telegram from Jap Emperor asking for peace." 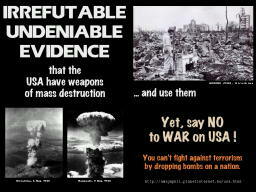 Why then proceed with using the atomic bomb? The most generous explanation would be that Truman did not fully understand what the atomic bomb would do, that he saw it as simply "another weapon". However, his military advisers knew it was in a different category. Even those favouring its use urged that it be used against a clearly military target with advance warning to civilians to leave the area. It is also possible that, being a politician, Truman wanted to justify the huge expense of the special crash program to develop the bomb--using it would prove to taxpayers that their funds had been well spent. The United States, acting on the advice of conservative political advisers--not on the advice of its military leaders--dropped the first atomic bomb without responding to any of the Japanese peace feelers. Then, three days later, and after the Soviet entry in the war had made immediate Japanese surrender inevitable, the second bomb was dropped on Nagasaki. The first bomb was dropped after Japan had already begun the process of seeking the terms of surrender. The second bomb was dropped when it was clear no U.S. invasion of the Japanese home islands was needed. Are crimes of war only those actions committed by the nation which committed aggression? Was it not a crime to use the nuclear bomb without exploring the Japanese peace feelers? Fifty years will have passed this August 6, 1995, and the question remains why anyone still believes the use of the nuclear bomb was necessary. Opposing evidence is overwhelming. It is as if, to shield ourselves from knowledge of what we did, we refuse to examine the history of that period. In closing it must be noted that neither the U.S. Congress nor the general public was even aware that a nuclear weapon was being developed, let alone that it would be used. As happens in war, morality vanished, secrecy prevailed, and great crimes were committed without consultation. From "50 Years Since the Bomb: A Packet for Local Organizers." Published by the War Resisters League. Compiled from articles by Gar Alperovitz, author of Atomic Diplomacy: Hiroshima and Potsdam, that appeared in the New York Times Op-ed page (August 3, 1989); Technology Review (August-September, 1990); and The Christian Science Monitor, written with Kai Bird (August 6, 1992). Readers are urged to get Alperovitz’ book for a full account. Gar Alperovitz is president of the National Center for Economic Alternatives and a fellow of the Institute for Policy Studies in Washington. A little boy raises his hand to his forehead to shield his eyes from the sun. His shadow seems to show he was saluting an invisible captain. A toddler laughs with pleasure as her father holds her up, spins her around and kisses her cheek as he leaves for work. Their shadow seems to show that he is holding her up to the sun. An older couple stroll in the gardens enjoying an early morning reprieve from the noise of their crowded street. Their shadow seems to show them holding hands. A while ago I discussed the lies surrounding the so-called Bay of Tonkin incident which was fabricated by the then US government to plunge them and us into the Vietnam War. I argued that it should be no surprise to us that the war on Iraq was based on lies and deceit. I argued that those who promote war will use any excuse to attempt to justify their acts of bastardry and terror. As we see now, just a few short weeks after the “end�? of this latest war, history is being re-written by them as they try and convince us they were right and we were wrong to oppose them. A feature article in Wednesday's Melbourne Age caught my eye. Written by Nicholas Kristof, described as a “Pulitzer Prize winner�? and New York Times columnist, the article is titled “Why the nuclear attack on Japan was right�? and it attacks “revisionist historians�?. Revisionist historians, let’s remember, are usually described as being part of the “black armband�? brigade or members of dissident communities fighting lost battles and Kristof doesn’t let us down. He accuses those of us who attempt to understand our society by what it does (or did) rather than meekly accepting what it said it would do (or did). Kristof argues that although there is persuasive evidence supporting the moral argument against the US dropping the only atomic weapons used in war so far, there is a far greater argument supporting it. His main line of argument follows that being written by Japanese historians. But what are the Japanese revisionists arguing? From what records are they gathering evidence to take up their “anti-American�? stand (wouldn’t Senator Alston love to join in this one) which shows the vast majority have deep reservations about the US use of nuclear weapons - both on Japan or at any time in the future. Well here are some of the historically recorded and publicly available statements and facts of that terrible time in and around August 1945 as provided by the US protagonists themselves. Admiral William Leahy, Chair of the Joint Chiefs of Staff and President Truman's Chief of Staff said, “[T]he use of this barbarous weapon at Hiroshima and Nagasaki was of no material assistance in our war against Japan. The Japanese were already defeated and ready to surrender ... In being the first to use it [the atomic bomb], we had adopted an ethical standard common to the barbarians of the Dark Ages.�? General Eisenhower said, "Japan was at that very moment seeking some way to surrender with a minimum loss of 'face'... It wasn't necessary to hit them with that awful thing.�? Fleet Admiral Chester W. Nimitz, Commander in Chief of the Pacific Fleet stated in a public address given at the Washington Monument on October 5, 1945, “The atomic bomb played no decisive part, from a purely military standpoint, in the defeat of Japan.�? Returning to Kristof for a moment, he argues that those who, in 1945, wanted a “test�? explosion on an uninhabited island off the Japanese coast to demonstrate the potential of the bomb and therefore cower the Japanese into surrender, were wrong. However, what do you think of the words of the Under-Secretary of the Navy, Ralph Bard, who in a June 27, 1945 memorandum stated, “Ever since I have been in touch with this program I have had a feeling that before the bomb is actually used against Japan that Japan should have some preliminary warning for say two or three days in advance of use. The position of the United States as a great humanitarian nation and the fair play attitude of our people generally is responsible in the main for this feeling�?. Bard resigned and his successor, Rear Admiral L. Lewis Strauss (who went on to become chairperson of the US Atomic Energy Commission) also stated that “the use of the atomic bomb … was not necessary to bring the war to a successful conclusion�? and “my proposal to the Secretary was that the weapon should be demonstrated over some area accessible to the Japanese observers, and where its effects would be dramatic.�? In effect Kristof is trying to do some revisionist history himself. He shy’s away from the facts that the US bombed Hiroshima and Nagasaki without warning and without just cause. He then argues that one faction of the Japanese elite grasped the opportunity to claim the bombing supported their “peace�? cause and thus, in some way, vindicates the fact that the US government lied to its own people, to its allies and carried out the worst act of mass destruction ever seen on earth by one human community against another. What Kristof doesn’t enter into are the political arguments that ignore human rights and moral dilemmas posed by such a barbarous act. The political arguments for using these weapons go something like this. The US was to meet the Russians and the Brits at Potsdam to sign a pact so that the USSR could join in the Pacific theatre. Truman delayed that meeting until the 17th July 1945, the day after the first test of an atomic weapon in New Mexico. Truman’s team did a snow job on the Russians and got them to agree to postpone their entry into the Pacific theatre for one week, from August the 8th to the 15th. The Russians agreed but realised they had been lied to when the first bomb was dropped on August the 6th and they subsequently entered the war on the 9th August, the day the Nagasaki bomb was exploded. The Japanese surrendered on the 10th and the US accepted a conditional surrender in order to cut the Russians out. Prior to this the US had demanded unconditional surrender of all political and royal titles. The August 10th surrender allowed the Japanese to keep their Emperor - which was central to their demands. Many historians argue that if the US had dropped the demand for an unconditional surrender earlier, the war could have been over by June 1945 and a peaceful resolution negotiated. So why all the fuss by Kristof about revisionist historians and their lack of “understanding�? as to why it was a good thing to kill 200,000 people? It seems that like our present situation, the US president was surrounded by hawks and was led by them. James Byrnes who was the National Security Advisor to Truman, convinced the President that the only way the Russians could be contained was by “bullying�? them into submission. This could be achieved by using a nuclear weapon on a city to show them what would happen if they threatened US imperial expansion. McGeorge Bundy, the most prominent supporter of the US bombing, argued that the use of the bomb was justified to save US lives and that the US military did not consider the weapons to be any different from conventional bombs. He finishes by saying that the US administration was unanimous in their decision. The US did conduct saturation bombing of over 60 Japanese cities in June and July 1945. Those raids are estimated to have killed over one million people and left 20 million homeless. Hiroshima and Nagasaki, which were key civilian industrial cities which were central to the Japanese war effort, were spared the terror of fire bombing so they could be sacrificed as demonstrations of this new weapon of mass destruction. Finally, lets turn to the man who ordered, knowingly and rationally (?? ), the use of these weapons. What kind of reply does President Truman make to hawks like Kristof? What was his stated reason for experimenting on human beings in ways the Nazi never dreamed of? In June 1945 Truman wrote in his diary that he knew the Japanese wanted to surrender. “Stalin will be in the Jap War on August 15th. Fini Japs when that comes about�? was another entry in July. He wrote to his wife a few days later and noted that “I've gotten what I came for - Stalin goes to war on August 15th with no strings on it... I'll say that we'll end the war a year sooner now, and think of the kids who won't be killed.�? Truman’s stated aim was to keep the Russians out of Japan and ruthlessly he and his advisors and senior government officers, went about deceiving their coalition partners about their strategic aims. In 1946 McGeorge Bundy was commissioned to create a range of falsehoods that prevail to this day and are spread by populists such as Nicholas Kristof. We cannot support on the one hand a system that we say is just, right and humanitarian and allows us the freedom to vote, speak our minds or even take to the streets while at the same time allowing that system to act against the stated moral principles we accept as underpinning our society. The time to stand up and demonstrate for what we know in our heart of hearts is right has come. All I ask is that you join the growing number of people willing to embrace the pain of change and actively assist in resisting the will of those who would do to us, what they have already allowed to happen to “them�?. While I’m sure there is a Japanese history that needs to be examined critically and widely, basing an argument on the say so of disaffected factions who claimed the high moral ground after the fact, places one on very shaky ground. Kristof would do much better than perpetuating the US governments tradition of Bundy like lies on the days we remember with shame, to think of the little boy whose shadow is burned onto a wall. Or to think of the father who still had the taste of his daughters cheek on his lips or the old couple whose surreptitious hand-holding was the last thing they ever did. Those images are always far removed from the warmongers and sycophantic minions who support them. Our leaders need to be reminded that there is no justification for war that includes the deliberate targeting of innocent civilians. There is no need to lie to us if their case for defensive violence is sound. We are not fools but I fear that unless we react, respond and unite to oppose war in our name, more innocent blood will be spilt – in our name. Government Censorship of Hiroshima, Nagasaki Revealed after 60 years! If you 're not going to the vigil, you may want to check out this documentary about how the US government censor virtually all of the images that came out of Hiroshima and Nagasaki. 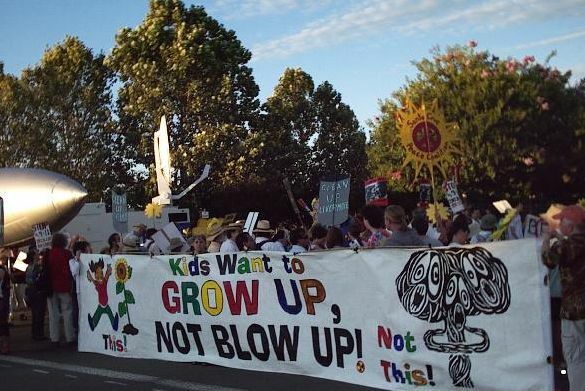 About 200-300 people rallied at Lawrence Livermore Labs on Saturday 8/6/05 from about 5PM-8PM to commemorate the nuclear bombing of Hiroshima and Nagasaki in August of 1945. Man In Black (Occasional supporter of Women In Black). No More Depleted Uranium Weapons. Some of the Iraqi civilian casualties were noted by name. 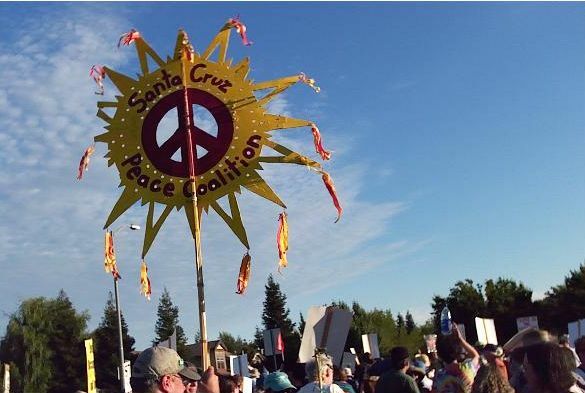 Santa Cruz Peace Coalition Banner. There were lots of folks at the rally. There was even a Larouche table promoting the benefits of giving third world countries new fangled pebble reactors (nuclear reactors). The concept of the pebble reactor is that the pebbles (spheres about the size of billiard balls)are designed to automaticly "shut down" the nuclear reaction if they start to overheat. The atoms move so fast when they overheat and the system is so sensitive that the reaction is derailed by the extra motion of the atoms. This sounds great at first. But from what little I have read, it seems that the spheres have to be perfectly spherical to a high precision in order for the reaction to shut down properly. Solar power is much better. The prices for solar panels may still be a bit high. But the technology has advanced to the point now that the payback period for a solar panel using the latest technology to generate as much electricity as was required to create it is now only 120 days, instead of the usual 8 years for the old silicon wafer and glass panels.